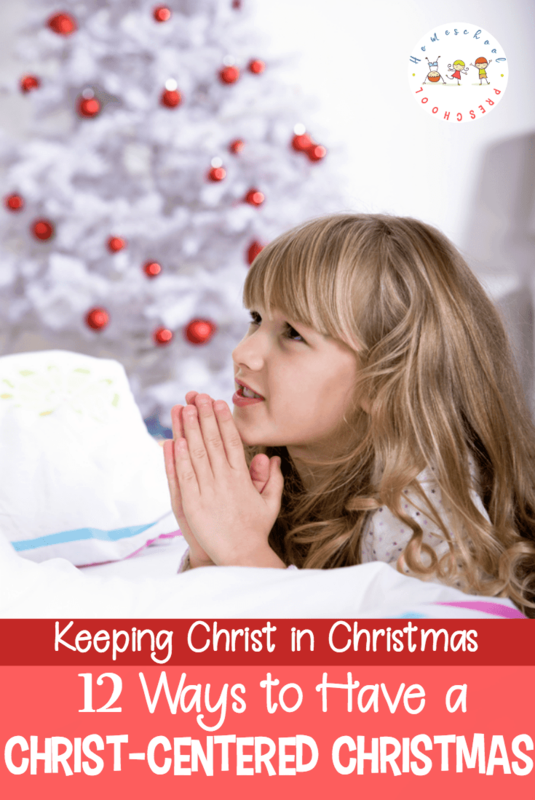 How can we keep the focus on Christ in the midst of all of the holiday festivities? 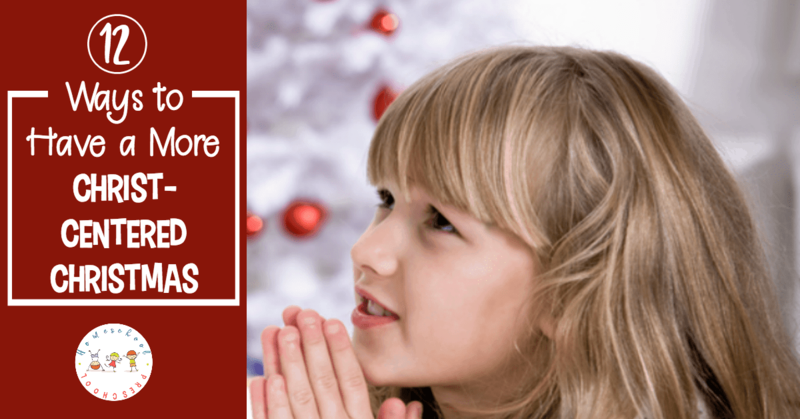 Here are twelve Christ centered Christmas ideas you can use with your preschoolers. Christmas is just around the corner. I know we have to get through Thanksgiving first, but Christmas is not too far away. Are you ready? I’m not. I haven’t even started thinking about Christmas, but I’m getting there. Whether or not Santa is part of your Christmas celebrations, it’s important to teach our little ones the true meaning of Christmas. We need to redirect their attention to the birth of our Savior, and focus less on the gift list. Focusing on others can help your little ones focus on Jesus. One thing I do is have my kids go through their toy boxes and closets to gather things that are in good condition but that they no longer use. We’ve already started gathering stuffed animals to donate ours to the police department. We also have plans to fill shoeboxes for Operation Christmas Child. 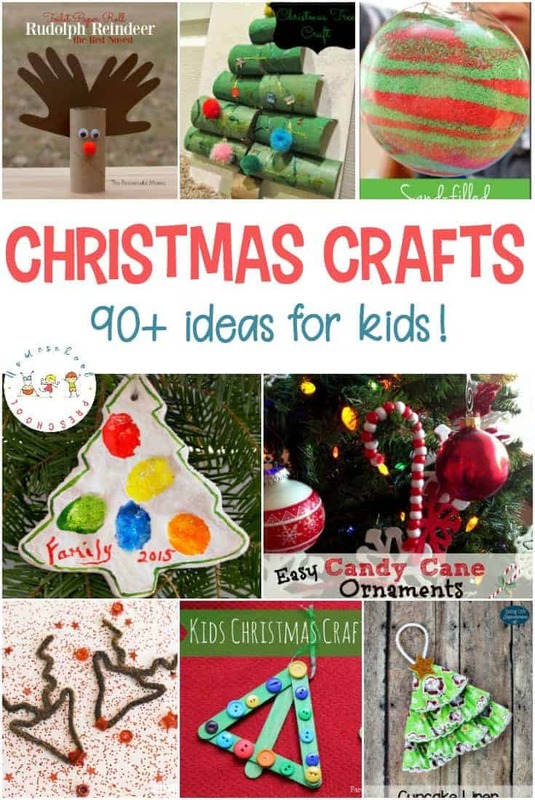 Your little ones will get such a thrill picking out gift items for a child their age. This is a great time to talk to your preschooler about the fact that there are children around the world that aren’t as privileged as they are. They may not have gifts under the tree without your shoebox. This can also lead to a discussion on being thankful for what they have. This is the highlight of our holiday season. Add a nativity scene or two to your holiday decorations. Let your preschooler help you set it out. Talk about the role each character had in the nativity story. Be sure to have at least one nativity scene on hand that is kid-friendly so that your preschoolers can play with it. Let them use the figures to tell you the story of Jesus’s birth. Have a birthday party for Baby Jesus. Years ago, when my oldest was little, my mother-in-law started an annual tradition. Every year, when we visited for Christmas, all of the children made birthday cakes for Jesus. Each child got their own cake to decorate. When they were all done decorating their cakes, we added candles, turned out the lights, and sang Happy Birthday to Baby Jesus . When I was growing up, we always had store-bought advent calendars to count down to Christmas. The kind where you pop open the little window and there was a picture or verse under the flap. Today, you can purchase calendars with candy or toys behind the flaps. 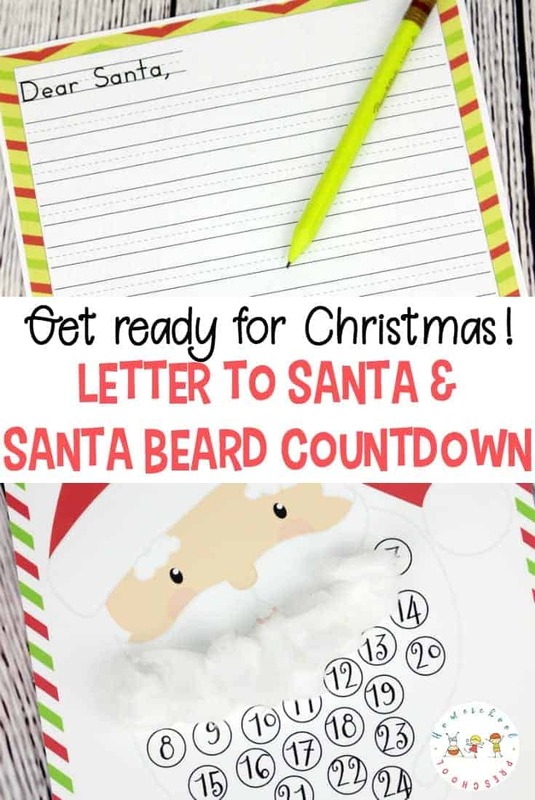 Many people use Elf on the Shelf to countdown to Christmas. I’ll admit that I have in years past. Emma loves to wake up on the morning to see where she’s moved and what she’s done overnight. But, I never used our elf, Lindsey, to keep the focus on Christ. I just had fun with her. However, last year, we replaced Lindsey with Melk, the Christmas Monkey . Melk, the Christmas , is an adorable little monkey who comes to visit and teach God’s character through the holiday season. In the book, Melk, the Christmas Monkey , there are 30 Bible-based lessons to teach God’s character to the whole family throughout the Christmas season. Because each activity is centered around a Bible passage, it’s easy to incorporate Melk into your Christ-centered holiday celebrations. Read it from the Bible. Read it from a Children’s Bible. Read storybook versions. Read it over and over again until your kids can retell you the Christmas story. Bring the Christmas Story to life. To help your child remember the Christmas story, incorporate their favorite toys into telling the story. When my daughter was younger, she used her Littlest Pet Shop animals to retell the Christmas story. My boys would have loved telling about Jesus’s birth with their Legos. 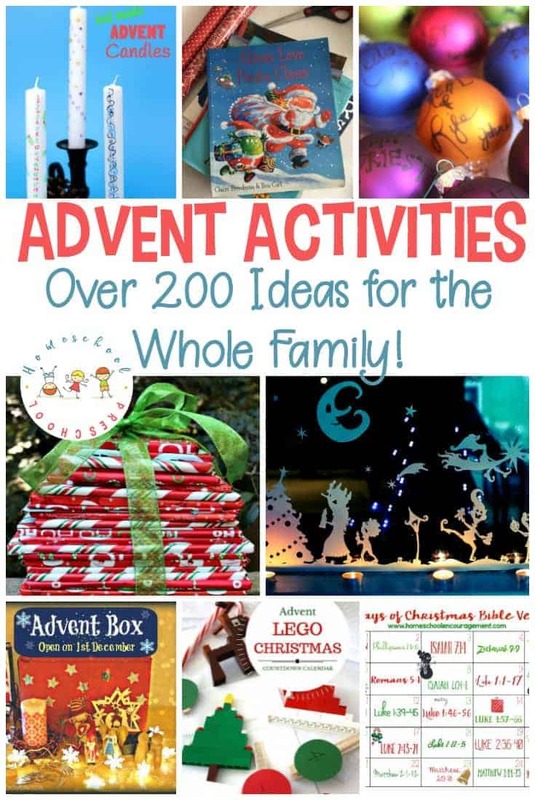 The Christmas Story Brick Challenge includes twelve days of activities that incorporate memory verses, coloring pages, and more – all built around a Legos theme. If you’ve got more than one child, this is pack great, because this can be adapted for multiple ages. Do nice things for others. Hold doors. Speak nicely. Help a loved one do a chore. Here are a few ideas for doing Random Acts of Kindness through the holiday season. A few weeks ago, I discovered this amazing resource from Not Consumed. 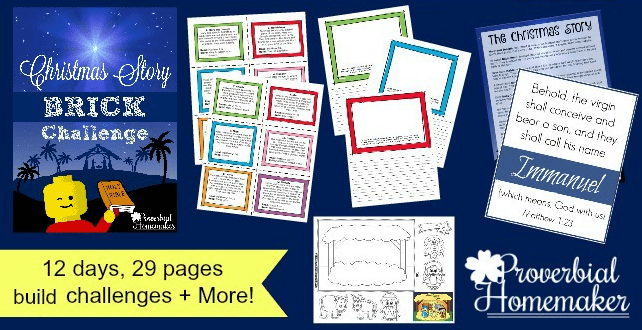 It is packed full of printables that cover Thanksgiving and Christmas (not to mention Valentine’s Day and Easter, too). This collection has over 100 pages! And, it’s FREE! For Christmas, this pack includes scavenger hunts, random acts of kindness, scripture readings, and more. Sing the classic Christmas carols that focus on Jesus’s birth. Talk about what they mean. See if you can find the original versionn and a version sung by kids. This will help keep preschoolers engaged. From the youngest to the oldest, keep the whole family involved. Let the younger ones retell the Christmas story to older family members. Have the older children read books and sing carols with the younger siblings. Have older siblings read advent verses aloud at dinner. Attend a Christmas Eve service. I always loved attending Christmas Eve services when I was growing up, and that didn’t change when I had kids. I enjoy hearing the pastor read the Christmas story from the Bible. I treasure an evening of singing classic Christmas carols with my family. Watching the young kids put on the Christmas pageant is always a great memory, as well – shepherds, angels, and little wise men! Make that one of your family traditions, too. What is your favorite way to keep Christ at the center of your Christmas celebrations?